This weather puts me in a soup frenzy: the colder and rainier it gets, the more I crave a big steamy bowl of hot soup. Did you ever read the book Stone Soup when you were little? The old folk story tells of hungry travelers passing through a village where no dweller wants to share his food. The travelers place a stone in a pot, and gradually convince each villager to add an ingredient. When they are done, the community has created a delicious filling pot of soup for both the travelers and villagers alike to enjoy. 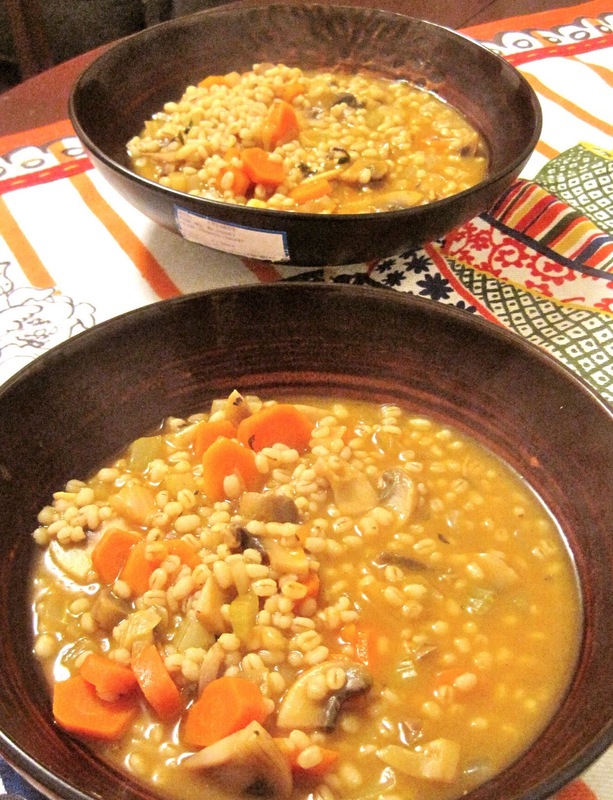 Tonight I made Mollie Katzen's Mushroom-Barley Soup, and as I added each ingredient and watched my soup transform- first sauteing the onions in olive oil, then the carrots, mushrooms and celery, next the seasonings, barley and vegetable broth, and finally vinegar and salt- I felt like I was in Stone Soup! Of course I didn't have a village to share with, but thats one of the great things about these large pots of soup: they freeze beautifully and are easy to defrost at anytime. Another reason I picked this soup is because it is vegan. After watching Forks Over Knives, a documentary urging Americans to eat as little animal-based foods as possible based on the scarcity of degenerative diseases in regions of the world where animal-based foods are rarely consumed, my roommate challenged herself to eat vegan for a week. As I am proactive about consuming whole foods and mindful of the negative environmental impact animal-based foods have on our earth, I became more conscious of the dairy products I was eating too. Although not something I am going to cut out of my diet completely, I am happy to report that I was very satisfied with this soup on its own. If you are eating it for a full meal, consider adding beans for protein. If the vegan thing is too much for you, feel free to add Parmesan cheese. Remember, if you use butter instead of olive oil, the soup is no longer vegan! Warning: Barley takes a long time to cook! Although the prep time for this soup is a little over an hour, the active time is only about 20 minutes. Try to plan ahead so you can do something else or prepare another part of your meal during the inactive time to avoid the old "a watched pot of water never boils" adage. Directions: I modified Mollie's directions so you only need to use one pot. 1. Heat butter or olive oil in a large saucepan over medium heat. Add onions and saute for about 5 minutes. Add garlic, carrots, celery, and mushrooms. Continue to saute, stirring occasionally, for 5-8 more minutes. 2. Add basil, thyme, oregano, and salt. Stir, and add barley. Immediately add vegetable broth and water, cover and bring saucepan to a boil. 3. When the saucepan boils, let the soup simmer until the barley is tender (20 to 30 minutes). Stir in soy sauce and sherry or red wine vinegar, and grind in a generous amount of black pepper. Simmer, partially covered, another 20 minutes over low heat. Taste to correct seasonings, and serve. Top with freshly grated Parmesan cheese if desired.